River Nomenclature Cards are formatted in a 3-part card series with black-line master included. 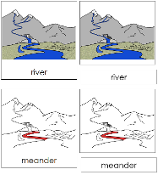 The 9 parts of the river are: river, source, tributaries, confluence, waterfall, meander, ox-bow lake, flood plain, and mouth. The river is in color, the individual parts are all shown in red.